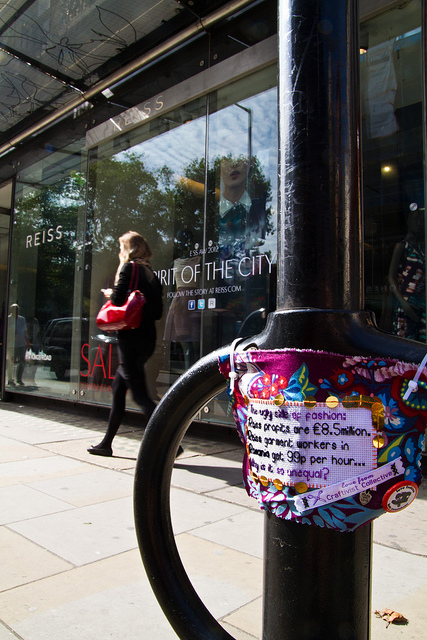 Home / Worth writing about… / All / Have you spotted any Mini Protest Banners at London Fashion Week 2012? 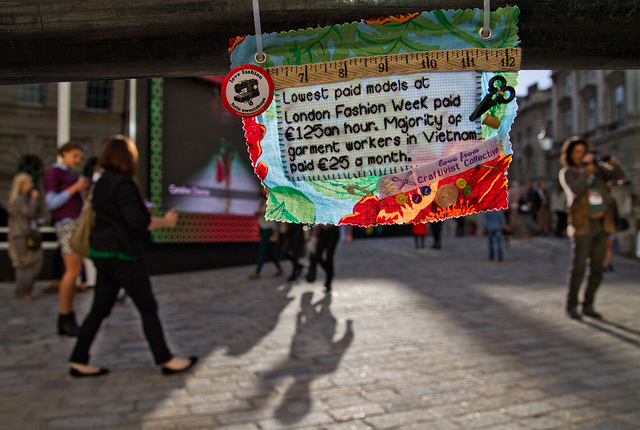 Have you spotted any Mini Protest Banners at London Fashion Week 2012? I wonder if Kate Middleton will see the mini protest banner outside Reiss? After 9 days my banner is still up! I made this mini protest banner with help from War on Want who gave me up to date facts to use. This fact impacted me the most- how can a company selling not-cheap clothes double their profits (with the help of free advertising from Kate Middleton who wears Reiss clothes a lot) in a year but still pay their garment workers less than £1 an hour? I was worried picking this quote to cross-stitch on that people would think “£1 an hour? That’s pretty good” but it’s not! Yes it might be better than Mauritian workers getting 21p (!) but it’s still abuse. We’re not trying to demonise Kate Middleton as a consumer or Reiss as a brand, check out our previous blog here with full details of the project. Thanks to Mari for making this video of Sarah putting up her banner. Robin (our photographer) and me also went out as a duo this Friday to Somerset House to put up this mini protest banner inside the heart of London Fashion Week. This is where a lot of the catwalk shows are, where the media hub is and where the fashionista footfall is huge! Unlike many activists who get a kick out of breaking the law or being rebellious, Robin and I hate it. We don’t like having to be sneaky and were pretty nervous going inside in case someone asked us what we were doing. But in the name of fashion justice we plucked up the courage, tried to look as fashionable as we could and walk in like we were part of the fashion industry. It was surprisingly easy. No one blinked an eyelid and there were so many photographers walking around taking photos of beautiful tall, super thin women that we went unnoticed, left the mini protest banner up and walked out happy and relieved. Hopefully lots of people see it over the next week and it provokes some thought & conversation. We would love you to make your own banner and put it up where you are (you don’t have to be in London!) to get people thinking. Don’t worry if you’re not the craftiest of sorts. You can still be a ‘craptivist’ and provoke discussion by sharing this blog and the images across Facebook, Twitter, Instagram and the like to spread the word far and wide. I hate asking this type of stuff in case it sounds pushy and arrogant but we would be really grateful and we would love other fashion-lovers to challenge themselves and the industry on the ugly side of fashion and think about how we can make it prettier. Sarah, you do such amazing work! I live in Ottawa, Canada and am inspired by you. Hoping someday to start a group here…unless you know of one already. I thought I was the only person not going nuts over fashion week, so this post has made me feel like less of an outcast – I’m currently reading To Die For by Lucy Siegle, and sweated labour drives me nuts, particularly when you can get ethically made, beautiful clothes for a fraction of the price of a ‘designer’ brand. Love the banner, I’m desperate to learn embroidery so I can make some of my own! (I’m a crocheter – good with a hook, not so much with a needle!) Hugely inspiring, thanks!